Suddenly appearing in people's lawns--in troops or lines or rings--this mushroom is well known and relatively easily recognized. Its distinguishing features include its shape and stature (see the illustrations), and the fact that the gills "deliquesce," turning themselves into black ink as they mature. 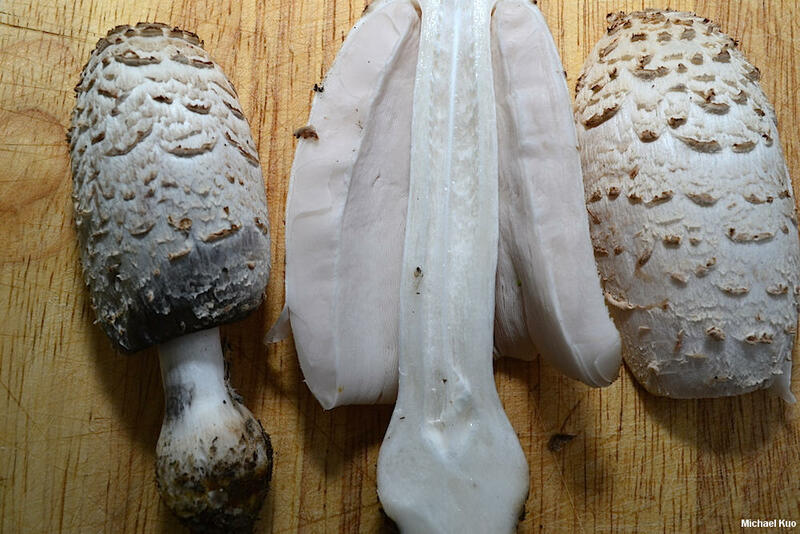 Shaggy manes are frequently found in disturbed ground, and the edges of dirt roads can produce many mushrooms. 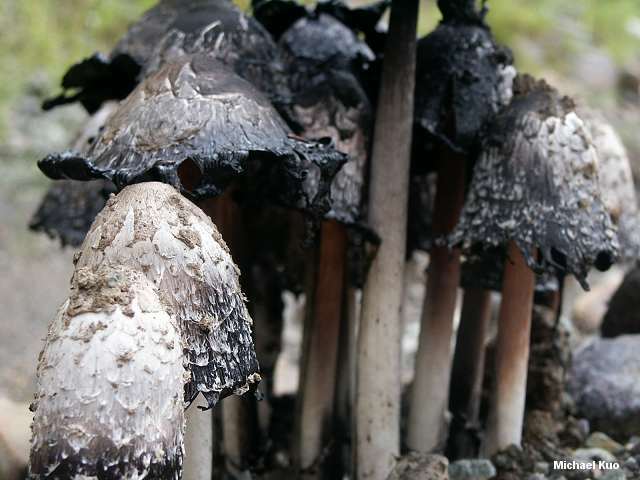 In the Rocky Mountains, Coprinus comatus can be seen from the car during monsoon season by simply driving four-wheel-drive roads and keeping an eye on the roadsides. 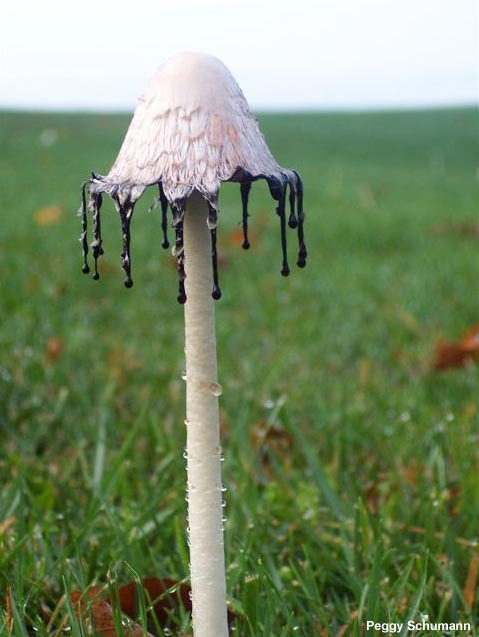 DNA studies over the last decade make it clear that Coprinus comatus is fairly closely related to species of Agaricus and Lepiota, but only distantly related to most other mushrooms whose gills turn to black ink--for example, Coprinopsis atramentaria or Coprinellus micaceus. 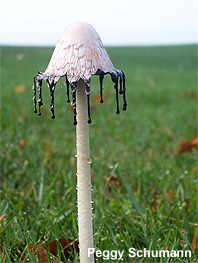 The genus Coprinus, which once held all such mushrooms, now holds only Coprinus comatus and a few similar mushrooms--and it turns out that the presence of a ring on the stem and a string-like strand of fibers inside the stem's hollow cavity (see the third illustration) turn out to be better predictors of the genus Coprinus than deliquescing gills. 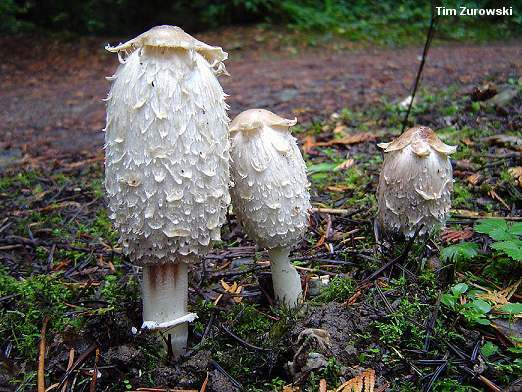 A monster version of Coprinus comatus from the Pacific Northwest, with a stem up to 50 cm long (that's half a meter! ), has been described as Coprinus colosseus. 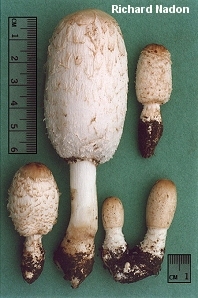 Several varieties of Coprinus comatus have also been described, including var. excentricus (spores 14-18 µ long, with a very eccentric pore), and var. caprimammillatus (spores 8-15 µ long, with a slightly eccentric pore). See van de Bogart (1976) for more information. Cap: 3-15 cm; oval to rounded-cylindrical when young, expanding to bell-shaped with a lifting margin; in age turning to black "ink"; dry; whitish with a brownish center; with large, shaggy scales; margin lined at maturity. Gills: Free from the stem; white, becoming pinkish, then black; turning to black "ink"; very crowded. Microscopic Features: Spores 9-13 x 7-9 µ; elliptical; smooth; with a central to slightly eccentric pore. Basidia 4-spored; surrounded by brachybasidia. Pleurocystidia absent. Cheilocystidia variously shaped; up to 60 x 40 µ. Pileipellis cutis-like. Veil elements cylindric; 7-30 µ wide. REFERENCES: (O.F. Mull., 1767) Persoon, 1797. (Saccardo, 1887; Kauffman, 1918; Smith, 1949; Smith, 1975; Bogart, 1976; Smith, Smith & Weber, 1979; Arora, 1986; States, 1990; Phillips, 1991/2005; Lincoff, 1992; Metzler & Metzler, 1992; Horn, Kay & Abel, 1993; Breitenbach & Kranzlin, 1995; Evenson, 1997; Barron, 1999; Roody, 2003; Uljé, 2003; McNeil, 2006; Miller & Miller, 2006; Kuo, 2007.) Herb. Kuo 09299608.